Welcome To Seville, Spain’s Most Charming City. Seville is the great city of the south of Spain – the home of Don Juan, Carmen, and Figaro, of orange blossom and jasmine and a blazing sun beating down on brilliant white buildings and lush green patios. The city is quintessentially Andalucian and is packed with narrow winding lanes and the best nightlife in southern Spain. Many city breaks to Seville are combined with trips to the other great Andalucian sights, in Granada and Córdoba. All have a wealth of history and together give a wonderful insight into the Spanish south. But of the three, Seville has the reputation for its intensity of life, with great festivals and an operatic tradition second to none. It is also home to world-famous traditions such as bullfighting and flamenco. Add in the three great buildings of Seville – the Cathedral, Giralda Tower and the Alcázar – and this is a city that will both entertain and bewitch. The Cathedral is said to be the largest in the world – depending on how you measure cathedrals! Its altarpiece is certainly the world’s most impressive. The Giralda Tower was the world’s tallest building when built by the Moors, and the Alcázar and its gardens are a brilliant blend of the two cultures – Christian and Moor – that have shaped the city. Seville combines ancient and modern with great style. The Festival of the Americas in 1929 and the Expo of 1992 produced imposing new buildings, bridges and transport facilities. The new tram and metro system looks impressive. The city has its problems – bag snatching and drug crime are commonplace – although worse may be found in both Madrid and Barcelona. Violent crime is less common than in many north European cities. 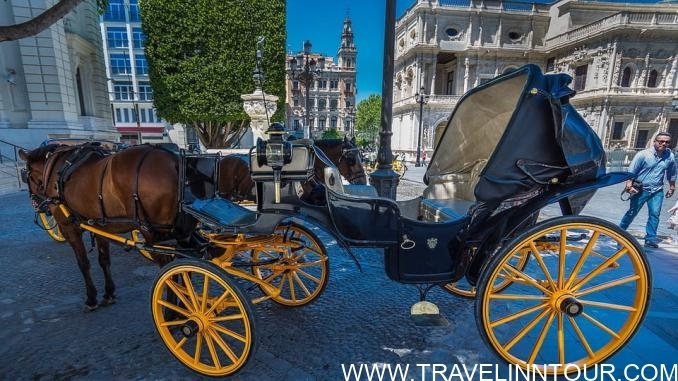 Whilst being modernized and cleaned-up, Seville is still essentially a romantic old city – whether enjoying tapas under the stars, sipping chilled fino sherry on a flower-filled patio, strolling the Guadalquivir or indulging in a horse-drawn carriage ride. Seville, the fourth largest city in Spain, is now easier to reach with budget flights and an excellent train service from Madrid. It’s a destination well worth considering for a winter break, or in spring and autumn when temperatures are ideal. It is, however, Europe’s hottest city, and Seville city breaks in mid-summer may best be avoided. The Giralda Tower, when first built, was the world’s tallest building. It’s only in recent years that budget flights to Seville have become widely available and visitor numbers by air are increasing rapidly. The AVE train service from Madrid is one of the finest train services in the world and well worth considering. Seville’s San Pablo Airport is 11km northeast of the city center. There are no direct train services but there is an airport bus – there can be lengthy queues – which drops off at the Santa Justa railway station, and at Puerta de Jerez, near the city center’s main tourist office. Taxis from the airport take less than 30min to get into Seville. Seville’s airport was much extended for the 1992 Expo. The majority of flights to Seville are by Iberia, Spanair and budget flight from inside Spain but there are now UK budget flights from Stansted and Liverpool – both with Ryanair, so be ready to add on the extras when you book. Other international flights are from Amsterdam, Dublin, Lisbon, London Gatwick, and Paris. Long-haul flights will normally require a transfer at Madrid or some other European hub airport. The airport is expanding rapidly with passenger numbers doubling in the past decade. There’s a full range of car hire companies and driving to Jerez, Cadiz, Córdoba or the Costa de Luz will each take about an hour. The main Santa Justa Railway Station is a couple of kilometers out of the center – taxis cost about €3 or you can get buses #27 and #32 for the city center. The rail station is very modern and offers the fabulous AVE express train service to Córdoba (40min) and Madrid in 2½ hours – there are fourteen or more trains to Madrid a day reaching speeds of 280 km/hr. From Madrid, there are connections to the European high-speed rail network. There are also rail connections from Seville to Barcelona, Cadiz, Jaén, Jerez, Granada, and Ronda (both with possible changes at Bobadillo), Malaga and Valencia. Seville’s main bus station is at Prado de San Sebastián. There are about 10 buses daily to and from Cadiz as well as regular services to Cordoba, Granada, Jerez de la Frontera, and Malaga. You can also catch buses to the Mediterranean coast, from the Costa del Sol in the south to Barcelona in the north. Many services use another bus station at Plaza de Armas, next to the river near the Puente del Cachorro. This has connections to Madrid and Aracena, other services in Huelva Province, Merida and northwest Spain. There are two services daily to Lisbon. It’s always worth checking locally which bus service uses which bus station. Seville is well served with motorways – the main arrival points are the E-5 from Cordoba and Cadiz; or the A-49/E-1 from Huelva and the Portuguese border, and the A-92 from Malaga. While the city boasts some wonderfully wide avenues, driving in the old city center is a nightmare with its narrow streets, one-way systems and near impossible parking. There are parking spaces down by the river and at the railway station. Seville may have been the port for the Americas 500 years ago, and it’s still Spain’s only river port, but arrival by sea is now a near-impossibility. There are cargo ships but few boats carry passengers. It’s not certain that Columbus’ tomb in the Cathedral contains the explorer’s remains. With the main attractions all within walking distance, Seville is an easy city to get around. Local public transport has improved dramatically with the construction of a new Metro system and for the more romantic visitor, there are horse carriages for hire. With nearly all the major sights within a short distance of each other, walking is the best way to enjoy Seville. Indeed, many of the streets in Barri Santa Cruz, including the main shopping streets, are restricted to pedestrians or are so narrow that only a scooter can get through. Walking tours for small groups (minimum four people) are available, Monday to Saturday (Monday, Wednesday and Friday in August). Tours of the Cathedral and Alcazar can also be arranged. Call 902 158 226 or 616 501 100 for information. The romantic way to tour the city, horse carriages are widely available around the Cathedral with an official price of €30 an hour. They seat four with the possibility of a fifth passenger seated next to the driver. There’s a good network of buses including services to the railway station and the airport. They’re also a useful way of returning to the city center after walks in the huge Maria Luisa Park and the Plaza de España, particularly in the tiring heat of summer. There are two open-top tour bus companies – SevillaTour (red buses) and Tour por Sevilla (green buses). They are based by the Torre del Oro on the riverside. They each cost €15 and are hop-on and off, but the limited number of stops, with lengthy distances between, makes this of limited value. While a good way to see the major parks, the narrow streets of the city center mean the buses are restricted to the main avenues, in effect the inner-ring road. The tour-bus section across the river is also disappointing. A brand new 19km tram system has been under construction since 2003. Work is complete on the Avenida de la Constitucion in the city center. Trams will connect Plaza Nueva, Avenida de la Constitución, Puerta Jerez, Calle San Fernando (the University) and the Prado de San Sebastian. It will connect the airport bus with Plaza Nueva. Eventually, the tram will link up with the Santa Justa train station. The Guadalquivir is one of the great rivers of Spain and Seville is the only river port in the country. Historically, the port was the main link with the Americas until Cadiz took over much of the traffic. 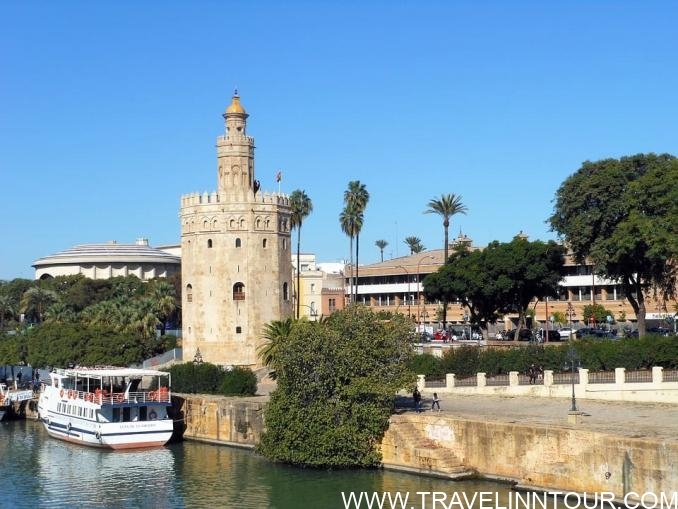 There are cruise boats by the Torre del Oro – there is a reduced price if combined with a Tourist Bus ticket – and the cruises last an hour with departures every half hour. While the views are OK, this is a pleasant way to cool down a little on a sweltering summer’s day. Taxis are numerous and reasonably cheap. They can be hailed in the street if the light is illuminated. Tips are generally 10%. The Moor al-Mu’tadid used his enemies’ skulls as flowerpots in the Alcázar. Seville is the hottest city break destination in Spain – and probably in Europe. It sits on the flat Guadalquivir River plain and simply bakes in summer, with temperatures nearly always in the 30s in July and August. The temperature tops 40°C every summer and reached 47.2° in 2003. This is a city where the siesta isn’t just a way of life, it’s a necessity. It’s hardly surprising that the Seville holiday hotel ‘low season’ is high summer when most people just want to get out of the city. Summer evenings are beautiful, however, hence Seville’s reputation as a late night city. Spring and autumn are the best times for a Seville city break. The weather will be warm, indeed often hot. Even in winter, it’s possible to enjoy many days of tee-shirt weather with average January daytime temperatures about 16°C. There’ll be plenty of holiday sunshine too, making this an ideal time for photography. Most rain falls in the winter months – indeed, a rainy day in the summer is a rarity, except for the odd thunderstorm. Total rainfall is about 700mm or 27ins a year with December the wettest month. Frosts are rare, typically on about four days a year. Semana Santa: The Holy Week of Easter is an amazing affair with a procession of hooded penitents and floats passing through the city streets. It may be based on a religious festival, but the Seville bars are packed day and night. Preparations for the festival take many weeks and many neighborhoods are busy building floats and making elaborate costumes. It all comes to a climax on Good Friday with the floats passing through Barrio Santa Cruz and converging on the Cathedral. A highlight is a float carrying an image of La Macarena, the patroness of bullfighting, the historic sports of Seville. Feria de Abril: It starts two weeks after the Easter festivities and lasts a week. It’s on the Triana bank of the river, features pavilions and tented displays, with men and women in traditional dress as Flamenco takes center stage. It’s a massive event and the atmosphere is exhilarating. Locals parade in horse-drawn carriages while visitors get carried away with the dancing and drinking. It’s also the highlight of the Seville bullfighting season. Bullfighting: The season runs from Easter Sunday to early October, with fights every Sunday, indeed every day during the Feria de Abril and the week before it. Be aware that only cheap seats in the sun are normally available unless you have a season ticket. The crowd is very knowledgeable and demanding. From early July onwards, many of the fights feature novices. The tickets are appreciably cheaper and are sold in advance at Empressa Pagés at c/de Adriano 37 and from 4.30pm on fight days at the bullring. Seville is a holiday city that knows how to enjoy life. It’s home to two of Spain’s great festivals, at Easter and two weeks later, in April. It’s the ultimate late-night city and home to flamenco. bullfighting and tapas. It’s everyone’s image of the real Spain. But Seville also has its problems. Unemployment is high and drug addiction is pretty common. Pickpockets and bag snatchers, sometimes using scooters, mean you must keep your wits about you. Seville is also a relatively expensive city with hotel rooms pricier than in most of Spain and near impossible to find during the two great festivals of Semana Santa and the Feria de Abril. But don’t be put off – the positives massively outweigh the negatives. Seville sits on the River Guadalquivir with most of the attractions on the east bank where the central area is full of old streets, churches, and squares in the Barrio Santa Cruz and El Arenal. Seville oozes history with its greatest monuments a reflection of the city’s Moorish and Christian heritage. The city was Muslim for 500 years from 712 until its reconquest by Ferdinand III. Moorish architecture remained dominant under the Christians, producing the Mudéjar style. It was the Moorish Almohads that built the Alcazar palace- although most of today’s structure is from the Christian period – and what was then the world’s tallest building – the Giralda tower, originally the city mosque’s minaret. Seville Cathedral is said to house the remains of Christopher Columbus. His discovery of the New World led to a Seville boom time as this became the main port for the Americas. The riverside Torre del Oro is where the empire’s gold and silver was stored. More recent years saw Seville stage two major events that transformed the city. In 1929, the Fair of the Americas, a celebration of Spanish culture, led to the massive Plaza de Espanya and many national pavilions around the Maria Luisa Park. The Expo of 1992 led to a complete overhaul of Seville’s infrastructure with new bridges, roads, railway station, and improved airport. Some of the Expo sites now look a little neglected but there’s no doubting Seville’s modernity. The city is now seeing the emergence of its tram/metro system. Spanish, heavily accented, is spoken in Seville. English is quite widely spoken but a few words of Spanish will be appreciated in restaurants and cafes. The Euro is the local currency. There many ATMs and a wide range of banks. Dial 061 for an ambulance. The local police number is 092 while the national police is 091. For medical services, go to the Centro de Salud El Porvenir (Tel: 955 03 78 17) or Hospital Virgen del Rocio (955 01 20 00). To telephone Spain, dial 00 34 followed by the local number. To call the UK from Spain, dial 00 44 followed by the number required omitting the initial ‘0’. The city’s codes are 954 and 955 and should be used when making local calls. 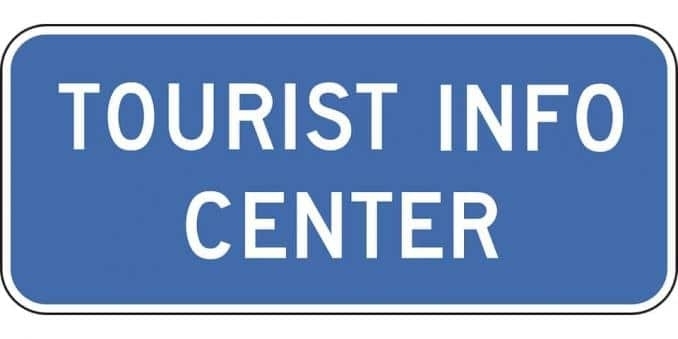 The tourist information center in Seville, Spain. Phone: +34 954 22 14 04. Address: 41007, Calle Joaquin Morales y Torres, 41003 Sevilla, Spain. Hope you enjoyed the 1st part of the Seville tourist guide. Your valuable comments are highly appreciated.